Most conversations between patients with terminal cancer and clinicians related to patient goals were not between the patient and their oncology provider, researchers found. Researchers incorporated a communication quality-improvement intervention for clinicians in the intervention arm of the trial, which included a clinical tool (ie, a structured communication tool called the Serious Illness Conversation Guide), clinician training (ie, a 2.5 hr, skills-based, palliative care faculty-led training session and follow up), and system changes (ie, an electronic medical record [EMR] documentation template based on the communication guide and timely distribution of the communication guide to the clinician prior to patient visit). Although clinicians in the control group were aware of the communication guide and template, they did not receive any training in their use. In this study, the clinician-provided communication intervention along with usual care (the control) were evaluated in clusters at a specific disease center within the Dana-Farber Cancer Institute in Boston, Massachusetts, and 2 affiliated satellite clinics during the period between September 2012 and June 2016. Patients were identified for the study by clinicians in both study arms and were considered eligible if they were 18 years of age or older and their clinician answered “No” to the question: “Would you be surprised if this patient died in the next year?” Patient-clinician interactions occurred in an outpatient setting, and patients were blinded to study arm. Only patients who died within 2 years of study enrollment were included in the analysis. 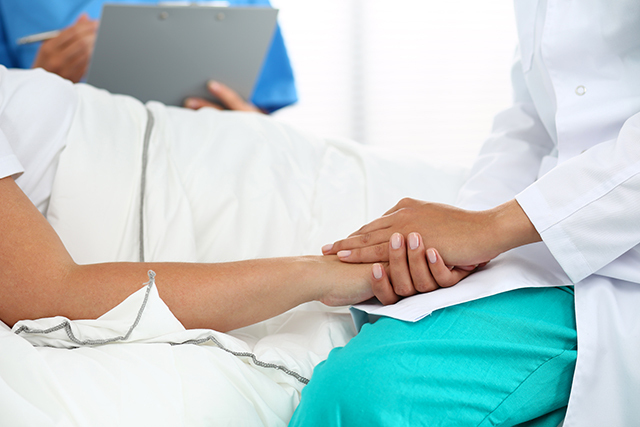 The primary study endpoints were goal-concordant care and peacefulness at the end of life, which were reported in a separate paper.2 The secondary study endpoints included documentation of at least 1 serious illness conversation before death; timing of the initial conversation before death; quality of conversations; and documentation accessibility in the EMR. Data related to these endpoints were abstracted from a review of patients’ EMRs after patient death by 2 trained, blinded researchers who performed independent evaluations. Ninety one clinicians were enrolled and randomly assigned (1:1) to intervention or control arms; of these, 76 clinicians had participating patients who died (161 patients) and were included in the analysis. Significantly higher rates of documented end-of-life conversations were observed in the intervention group compared with the usual care group (96% vs 79%; P =.005). Furthermore, compared with the usual care group, these conversations occurred earlier in the intervention arm (median, 143 days vs 71 days; P <.001), and documentation of these conversations had a greater focus on values or goals (89% vs 44%; P <.001), a greater focus on prognosis or illness understanding (91% vs 48%; P <.001), and a greater focus on life-sustaining treatment preferences (63% vs 32%; P =.004) in the intervention arm. Although documentation about end-of-life care planning did not differ significantly when the 2 study arms were compared (80% [intervention] vs 68% [control]; P =.08), more patients in the intervention arm had documentation that was accessible in the EMR (61% vs 11%; P <.001).